A sneaky way to get accurate plans of stations is to find the fire alarm control panel; it's usually exposed to public view, and has a plan of the station stuck to it. I don't know if this is the case at Green Park, nor how staff would respond to you taking a photo of it! 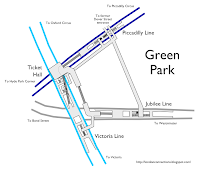 One can still change between the Piccadilly and Jubilee Lines via the ticket hall. Indeed, this is how one used to have to make the interchange, before the Jubilee extension opened and, with it, the long interchange tunnel. Have you ever noticed the mosaic tiling on the Jube-Piccadilly tunnel? At the Jubilee end, all the tiles are either grey or white. At the Piccadilly end, they're Piccadilly blue or white. As you walk between the ends, the proportion of blue to grey tiles changes. There are some weird things underground in the area - given its proximity to who knows what hush hush buildings - this might explain the eccentric routing. Also, it always always smells of 'old moppets' - dishcloths which have gone off - whenever I've used it.